This is the last post in the “What’s in a Name?” series. I am a little behind my intended timeline, but we have been busy learning! At school, we are coming to the end of our name project and we will be moving on to investigating our class name…”Burton’s Beetles.” For the last couple of weeks we continued to describe information about our classmates in different ways. One way is through Concept Circles. A concept circle has four quadrants, each with a picture and word to describe a member of our class. The children refer to our All About Me charts and determine which child is featured in the concept circle. Then they find the name to match the concept circle and place it above the circle. 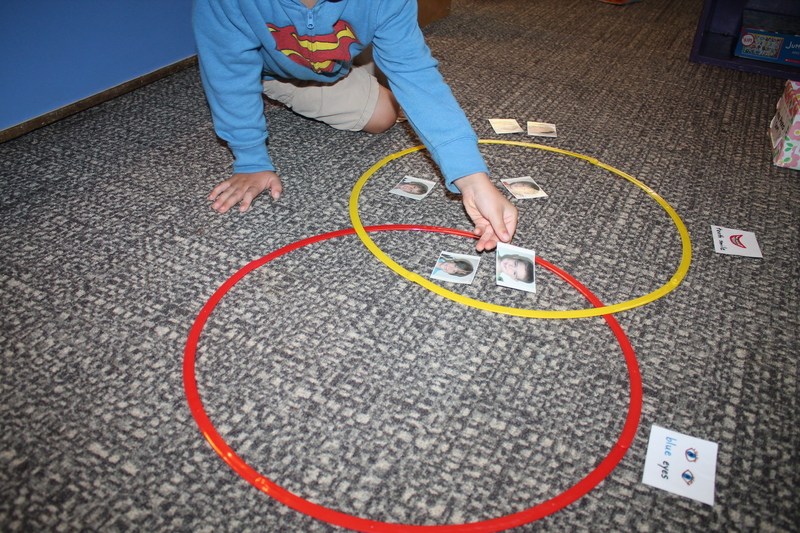 The children enjoy matching the names to the circles. The activity also sparks a lot of conversation among the children about similar interests, favorite colors, etc. It is a fun way for the children to solidify their knowledge of classmates and to establish friendships. Another activity the children really enjoy is called “Roll, Say, Keep”. I can’t remember where I first learned about this game, but the concept is not my own creation. 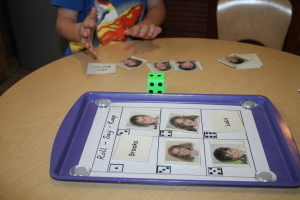 This game can be adapted for almost any skill, but we use it in our name project to identify classmates by their picture and to practice reading names. The game requires a die and a sheet with six sections, delineated by the dots on each side of a die. One picture card or name card goes in each of the six boxes on the game board. The children take turns rolling the die and identifying the picture or name in corresponding section on the board. This game also encourages lots of conversation and requires the children to use each other’s names for a meaningful purpose. Finally, I introduced the use of Venn Diagrams to categorize information about our classmates. 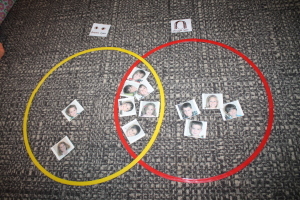 The children need two overlapping circles, pictures of all of the members of the class and category cards. 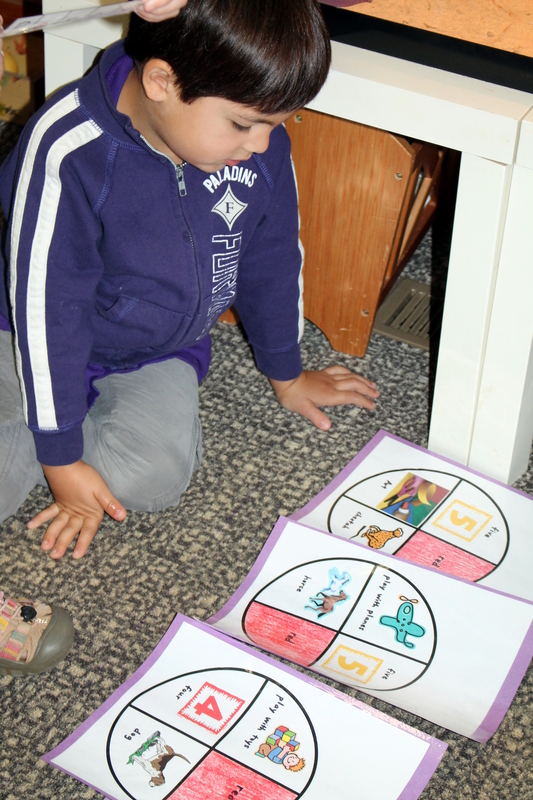 We use categories that are easy to identify through pictures or looking at our friends’ names. Some of the categories we have are: brown eyes, blue eyes, brown hair, black hair, blonde hair, 5 letters in name, 2 syllables in name, and more. 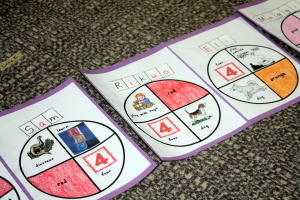 The children work in pairs and select two categories. Then they go through each of the picture cards and sort them into the correct section of the Venn Diagram. My four and five year olds are getting very good at this! Hope you enjoyed a peek into our Name Project!